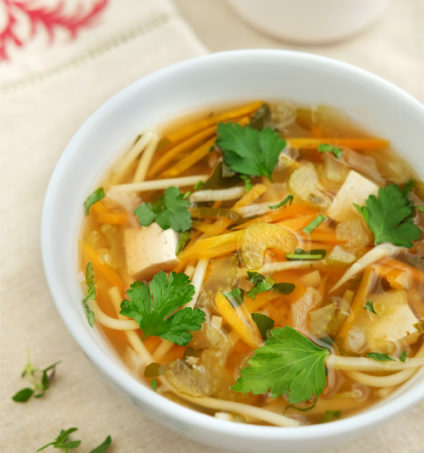 The Vegetarian Society has created a warming ‘Comfort Soup’ recipe packed with goodness. Give it a try! When the season of colds and flu is upon us, we all have a favourite comforting dish that makes us feel better. The Vegetarian Society asked its members and supporters for their go-to culinary hugs and soothers. The replies ranged from hot toddies with ginger and chilli, to stews, spicy curries and hearty soups – there was even a raspberry latte. However one item kept cropping up: people wished they had a comforting noodle broth which could nurse them through the sniffles. So the Vegetarian Society has created a warming ‘Comfort Soup’ recipe packed with goodness. 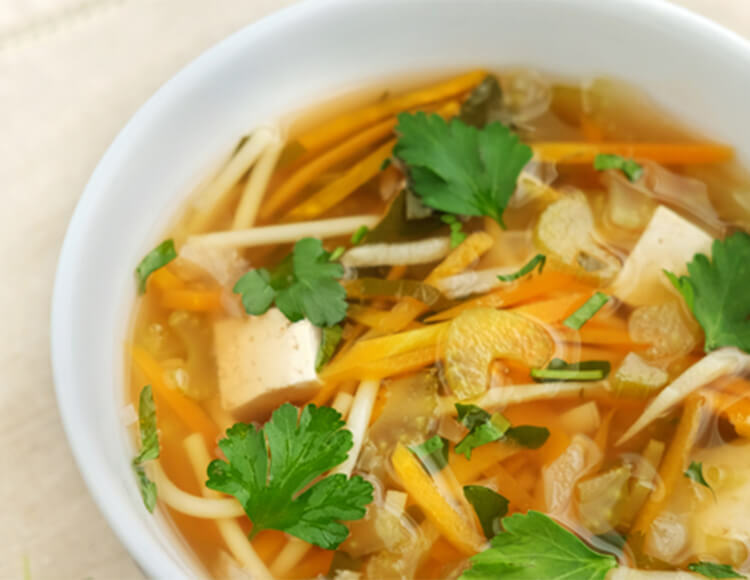 We’ve used ingredients previously tested by scientists in a study of noodle soup, which showed that many of these vegetables and herbs were effective in reducing inflammation associated with having a cold. A big thanks to Sue Gilmore from Essex, UK, for the idea. Give it a try! Here at the Vegetarian Society, we are passionate about veggie food! We want everyone to know how varied and delicious vegetarian dishes are – and how easy it is to enjoy a veggie lifestyle.